Das OnePage Template gibt es jetzt in 3 Varianten. Die Unterschiede der 3 Templates bestehen in der Darstellung des CMSimple-Menüs auf mobilen Geräten und schmalen Displays. 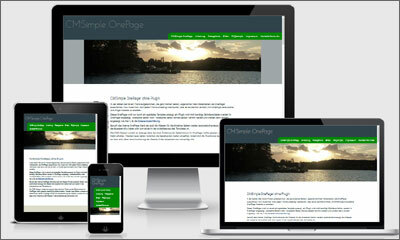 The OnePage Template is now available in 3 versions. The differences between the 3 templates are the display of the CMSimple Menu, visible only on mobile devices or small displays.